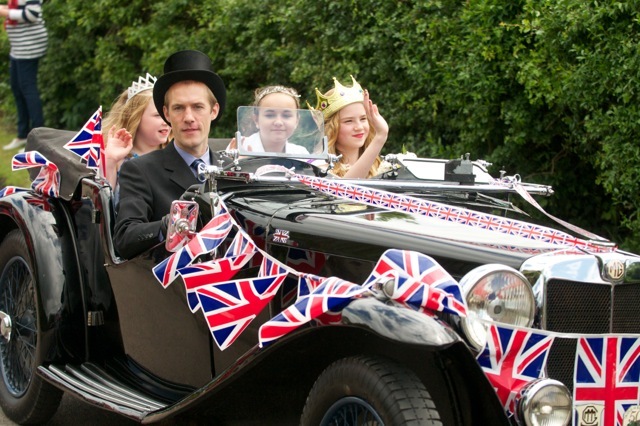 We had an amazing Jubilee Weekend in Orwell. It started on Saturday June 2nd 2012 with the Jubilee Pannier Market, which was busier than ever with people collecting their mugs and buying disco tickets. We had a splendid afternoon in St Andrew's Church, singing over forty of our favourite hymns, accompanied by cream teas. Thanks to our four organists and to all the visitors who made it such a friendly and enjoyable occasion. Monday, the big day! Teams of people were up and about early, getting everything lined up for the moment when Town Green Road would be closed. Then it was a question of trying to find somewhere to sit! Unexpectedly high numbers meant that extra tables were needed and many people had to find makeshift perches. 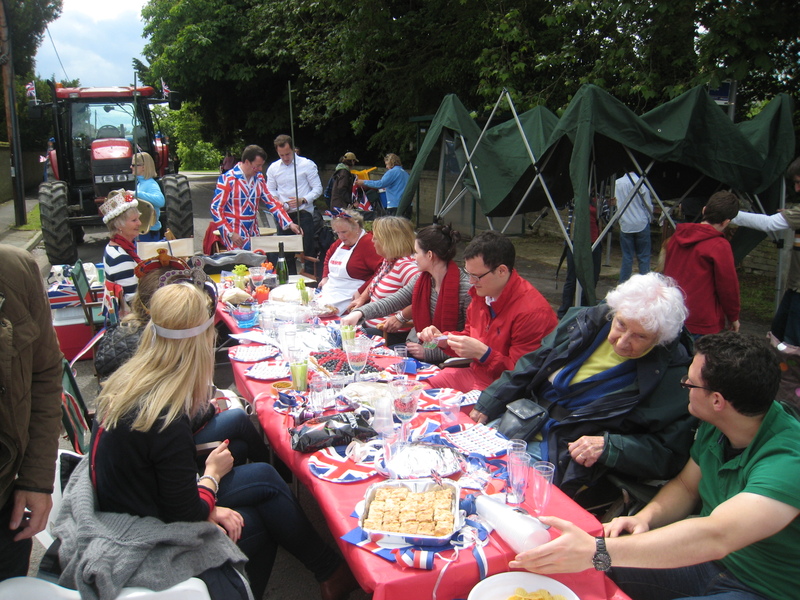 Picnics were laid out, tables decorated , crowns and tiaras polished, quizzes addressed and glasses raised. The street party was under way. Entertainment during the afternoon included The Savoy Jazz Band, Maypole dancing by the children from Petersfield School, The Queen and her Guy sketch by Caroline Crews and Ian Rumbold, a Bouncy Castle and giant games, and a grand finale (in the pub to avoid electrocution) from our own Retro Rebels. As if this wasn't enough, the evening entertainment started at 7.00pm in the Village Hall with a Junior Disco – a sell out and a great success judging by the number of little (and not so little) people dancing to some very loud music! 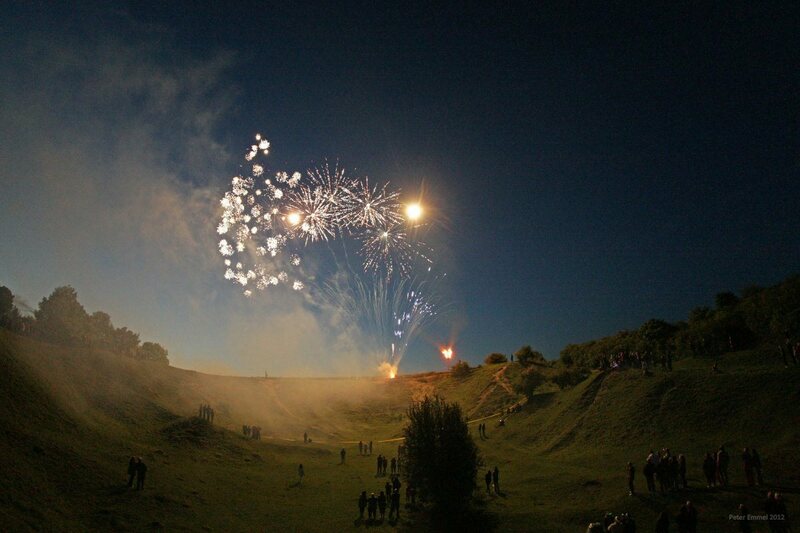 At 9.45pm we made our way up to the Clunch Pit where the Beacon was lit at 10.01pm. This was followed by a spectacular display of red, white and blue fireworks in honour of the Queen, culminating in a golden 'crown' which hung in the sky over us. Everyone has commented on how superb this was, with the display clearly designed for the very special setting of the Clunch Pit – and a giant moon appearing over the trees for extra effect! A spine-tingling moment was created as voices on one side of the darkening Clunch Pit began to sing the National Anthem and gradually we all joined in the rousing chorus. 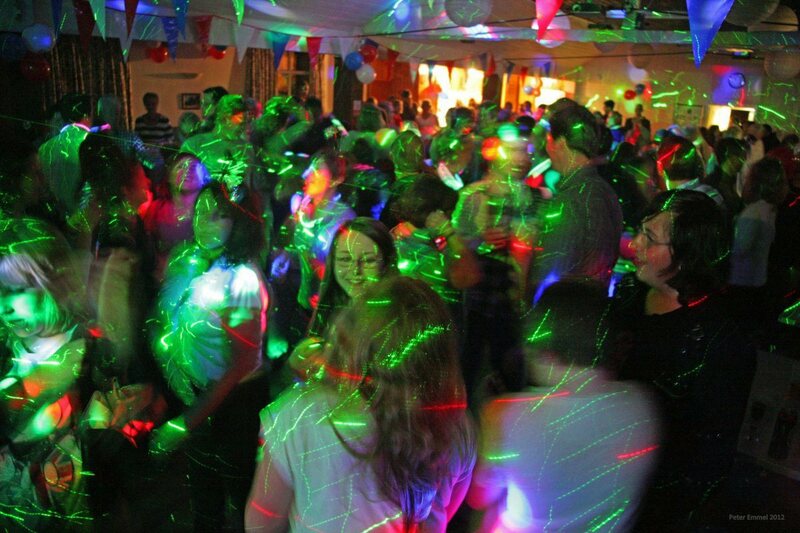 Those who still had the stamina returned to the Village Hall for another sell-out disco and danced till midnight. Thanks must go to the excellent team who worked so hard to provide entertainment, food and drink to a vary large number of satisfied customers. Throughout the weekend our local history group's exhibition, illustrating 'Life in 1952' was viewed by many in Lordship Community Room. This exhibition was funded by the Heritage Lottery Fund as part of the group's current project to encourage us all to research and record Orwell's history, and thanks are due to the many people who contributed their memories and memorabilia for display. The Commemorative Mugs, chosen by the Orwell Youth Project, have been given to over 140 children up to the age of 16, and at the time of writing there are only 30 left to sell out of the 400 we ordered. 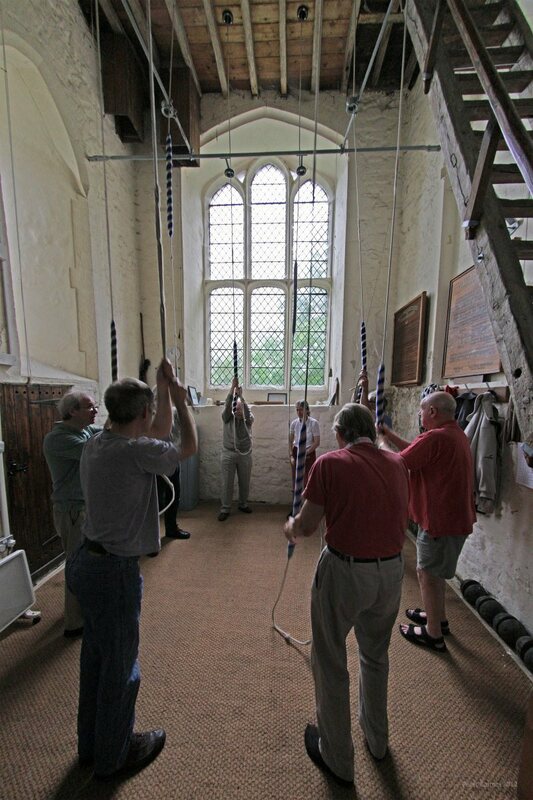 Bellringing. A successful peal of eight spliced (difficult stuff!) was rung on Monday morning at St Andrew's Church to celebrate this special occasion. Accora, David Gould, Malton Golf Club, Mantles, CR & MR Marriott, Sharman Knowles, Volac, and Wilshers Garages. Orwell Carpet Bowls Club, The Orwell Players, The Village Hall and Orwell WI. Also Orwell and Wimpole Parish Councils. A big thank you to them all. 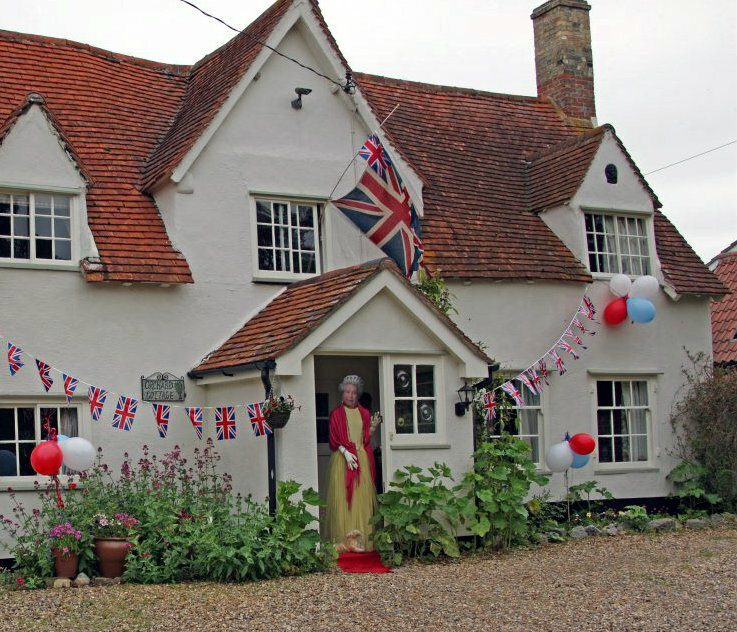 Sebastian Kindersley, who judged the competition, wanted everyone to know that he thought that Her Majesty would have been delighted to see so many well decorated houses in both parishes. He personally thanked those people who had entered the competition, and praised the high quality and diversity of the exhibits. A great deal of hard work, imagination and attention to detail had gone into all of them. The results were : First Prize, Ian and Lynn Rumbold of 2, High Street. This entry was well imagined, used real animation, and was interactive. The use of the dog was really amusing. Second Prize, Donna Titchmarsh, 43 Meadowcroft Way. This entry showed tremendous effort and enthusiasm with attention to detail. Third Prize, the Belbin family at Orchard Cottage, Town Green Road. This entry was a great idea, in bringing the Queen to Orwell. It was well executed, and again the dog was a charming addition. Our thanks are due to Sebastian, who said that he had thoroughly enjoyed the experience. 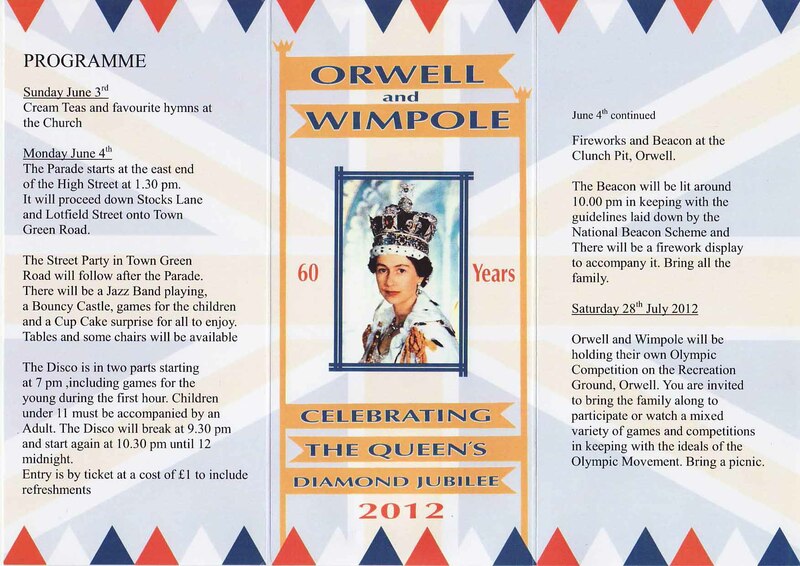 And Ian Rumbold speaks for us all when he says “Orwell is on the Up following a fantastic Diamond Jubilee weekend for which the organisers need a big thank you and congratulations. 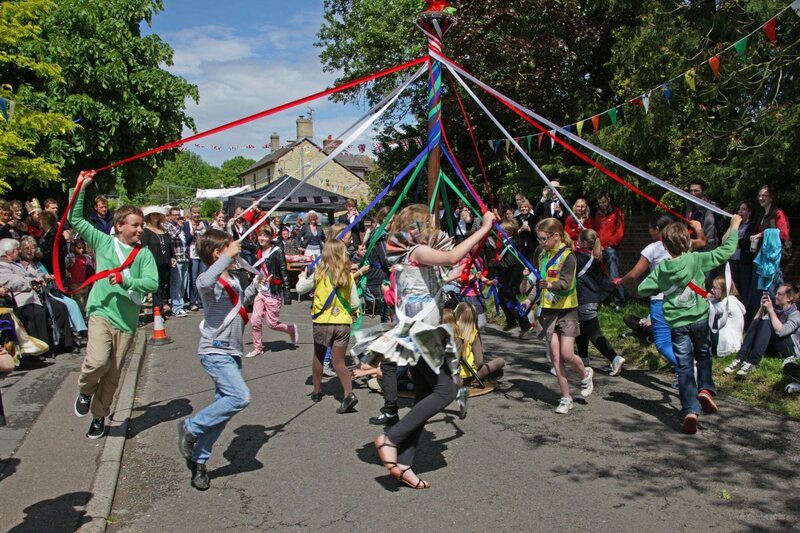 The Street Party, Fireworks, Disco, History exhibition, Float Parade and so much more gave the village back a bit of its fun factor. This page was added by Martin Grigor on 03/02/2013.